The Mississippi and its tributaries, major highways of commerce and travel for centuries, gave rise to the bustling native communities of the lower Mississippi. Enriched by goods and materials from as far away as the Great Lakes, the Mississippiansthe last in a line of moundbuilderserected monuments whose majesty and complexity of construction still astonish. The wealthy drove the trading system. Because they took their prized possessions to the grave (their status symbols) their children had to accumulate their own marks of rank. The demand for luxury items fostered trade across the region, and beyond. Raw copper, likely from the Great Lakes area, was cut and delicately hammered into bracelets, beads, rings, ear spools, and embossed effigies of falcons and other birds of prey. From the Gulf of Mexico came marine shells called whelks or conchs, which were worked into perforated necklaces and large disks carefully decorated with intricate designs. There was also a demand for tools and utensils, which villagers took to the grave to denote their own roles or status: for men, axes and fishhooks; for women, pestles and nut-cracking stones. The Mississippian culture is gone now, but the artistry of the moundbuilders continues to lure looters to the mounds. 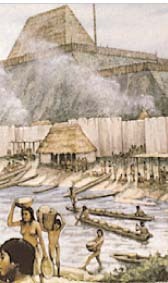 With few exceptionssuch as the record of Hernando DeSoto's Spanish armythere are no documents of what travelers saw in the age of the moundbuilders. DeSoto's entourage, which traversed the valley in the 1540s, came when the cultures were in decline. DeSoto landed near Tampa Bay, Florida, and for two years trekked across what are now the states of Florida, Georgia, South Carolina, Tennessee, Alabama, Mississippi, Arkansas, Texas, and Louisiana. He visited a number of large communities in the Mississippi valley. The legacy of the Mississippian moundbuilders lives on today in the rich archeological record, which includes materials like pottery, copper, and shell. Retrace the steps of Hernando De Soto, exploring the valleys he discovered along the lower Mississippi, the communities there, and the picture of the region when he arrived. Left: Shells from the Gulf of Mexico and copper from the Great Lakes fed the demand for jewelryespecially among the rulers, who often lived atop the mounds.